Please send a mail to receive information. From ancient times concepts of the ideal man, of his body and its proportions as well as ideals of beauty, have played an important role in art and science. They continue to be of great importance in contemporary society. Various concepts of beauty originating from different times and cultures are more and more levelled out today. This tendency culminates in the idea of the artificial creation of an ideal man. Meanwhile mankind has created a system of ideals to which it must subordinate himself. Despite of different origin, size, colour, habits and cultures we are forced to adapt to standardised furniture, houses, architecture, and cities, to a common aesthetic, to a certain style or trend. Is this only due to a functional, affordable system of production or are there different intentions working behind this system? The famous Renaissance artist and scientist, Leonardo ad Vinci, had a strong interest in the human figure and its harmonious proportions. He created the widely known figure of a man that fits into an interlocking circle and square. It became a symbol of a perfect harmony and an ideal human figure. I enlarged this drawing up to the size of an average contemporary figure and used it as a scale. In front of the reproduction I photographed people originating from different countries and originating of different races and cultures. 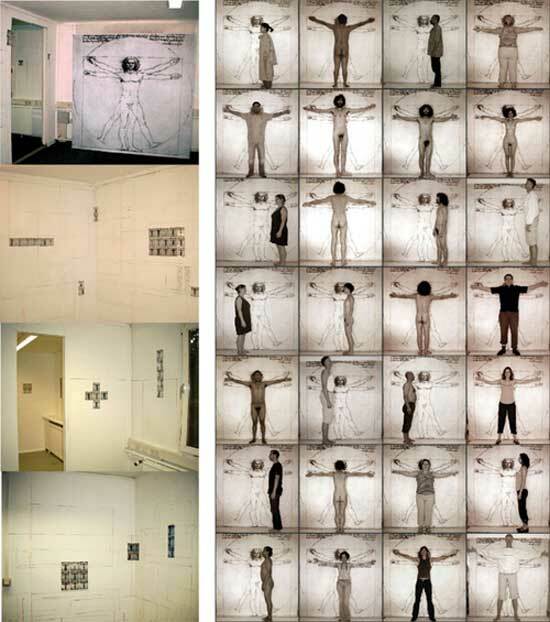 297 photographs of about 99 persons have been taken, all in the format of 10 x 10 cm. They are used for the installation.